I had hiked in to a spot beside a river to look for wildlife but nothing was around at the time. Instead of leaving, I decided to lay down and have a nap in a spot that if something did show up I would be a in a good spot to get photos. I quickly drifted off for a light sleep for about an hour. When I woke up I scanned the area before I sat up, but again I didn’t see anything. 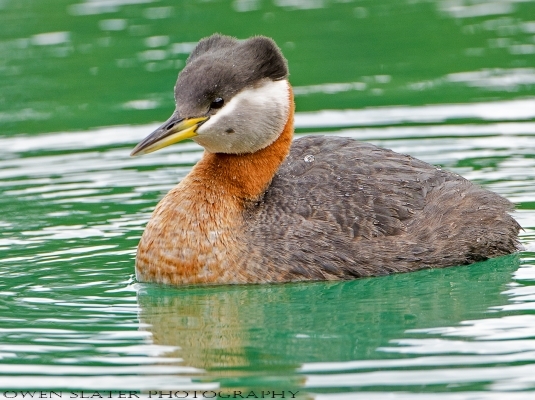 Figuring I should move on I sat up and almost immediately this grebe popped up in the water about 20 feet away. I waited until it dove back under the water before I moved back into position and waited. My wait wasn’t very long. It surfaced right in front of me and stayed there just long enough for me to get a few photos.